The German champions will be without defender Joshua Kimmich, however. DAVID ALABA AND Kingsley Coman are back in the Bayern Munich squad ahead of Wednesday’s clash with Liverpool, Niko Kovac confirmed earlier today. The sides played out a 0-0 draw in the opening leg at Anfield on 20 February, and since then Coman has missed each of Bayern’s last two matches as he’s battled a hamstring issue. 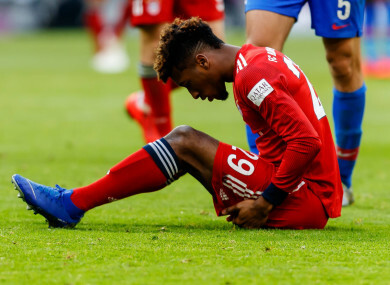 Coman has dealt with a number of knee issues throughout his Bayern career, and even hinted in December that he could retire if he was hit with another serious injury. However, the recent hamstring issue proved to not be serious and he will be ready for Tuesday’s match. “[He] handled the maximum load in training on Monday, so he is fit,” Kovac said of the French winger. Kovac added that ”we have to look” at whether Coman was fit to start or would be more capable with coming off the bench in a more limited role. Alaba, meanwhile, is set to return after irritating a tendon issue and has also missed two matches. The defender has played 23 Bundesliga and six Champions League matches this season, and Kovac says he’s ready to contribute on Wednesday. “So far, I assume he’s ready to go,” the Bayern Munich boss said. Bayern will be without right-back Joshua Kimmich through suspension, however. Kovac went on to say that he sees Wednesday’s clash as a ”highlight game” against the “cream of world football”, as Bayern look to seal a spot in the Champions League’s quarter-final round. Bayern have reached that quarter-final round in each of the last eight seasons, last falling in the Round of 16 in 2012 to Inter. In the Bundesliga, the club are top of the league as they battle Borussia Dortmund for the top spot. Bayern maintain a lead on goal difference – plus- 35 compared to Dortmund’s 33 -and face another of Jurgen Klopp’s former teams, Mainz, on Sunday. Email “Bayern given double injury boost ahead of Liverpool showdown”. Feedback on “Bayern given double injury boost ahead of Liverpool showdown”.